A Lovebird is one of nine species of the genus Agapornis (Greek: αγάπη agape 'love'; όρνις ornis 'bird'). They are a social and affectionate small parrot. Eight species are native to the African continent, while the Grey-headed Lovebird is native to Madagascar. Their name stems from the parrots' strong, monogamous pair bonding and the long periods in which paired birds will spend sitting together. Lovebirds live in small flocks and eat fruit, vegetables, grasses and seed. Black-winged Lovebirds also eat insects and figs, and the Black-collared Lovebirds have a special dietary requirement for native figs, making them problematic to keep in captivity. Lovebirds are 13 to 17 centimeters in length and from 40 to 60 grams in weight. They are among the smallest parrots, characterized by a stocky build, a short blunt tail, and a relatively large, sharp beak. Wildtype lovebirds are mostly green with a variety of colors on their upper body, depending on the species. The Fischer's Lovebird, Black-cheeked Lovebird, and the Masked Lovebird have a prominent white ring around their eyes. The Abyssinian Lovebird, the Madagascar Lovebird, and the Red-faced Lovebird are sexually dimorphic. Many colour mutant varieties have been produced by selective breeding of the species that are popular in aviculture. 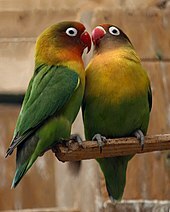 The lovebird genus comprises nine species of which five are monotypic and four are divided into subspecies. Eight of them are native in the mainland of Africa and the Madagascar Lovebird is native to Madagascar. In the wild the different species are separated geographically. Feral populations of Fischer's Lovebirds and Masked Lovebirds live in cities of East Africa. Also present there are intergeneric hybrids between these two species. The hybrid has reddish-brown on head and has orange on upper chest, but otherwise resemble the Masked Lovebird. With their inclination to bond, they can form long-term relationships with people in tandem with their intra-species companions. Aggression is easily aroused in lovebirds, however, and biting may occur unless a bond is established with gentle handling. Provided with adequate space, a stimulating environment, and appropriate nutrition, a lovebird can become a cherished companion parrot. They love to snuggle and often preen their favorite people. It is preferable to obtain birds bred in captivity, rather than birds caught from the wild. Wild birds may be harboring a disease, such as avian polyomavirus. Captured wild lovebirds also may mourn the loss of association with a mate or a flock. Their age is likely to be unknown, and they may have an unsuitable personality for domestication. Lovebirds are not necessarily best kept in pairs, as their name suggests, although relationships with humans are then less likely to be as intense when paired. Birds kept individually or brought up hand-fed, make very good pets. However, single birds require frequent attention to stay happy, and if the owner has limited time to spend daily with a single lovebird, it is preferable to grant the lovebird a companion of the same species, or a companion of another parrot species known to get along well with lovebirds. Lovebirds can become very interactive with humans, and when comfortable, will willingly perch on a finger or shoulders. Some Lovebirds talk, but many will not: there is a chance they may learn to mimic human sounds if taught to do so at a young age. Lovebirds are noisy, with calls ranging from cheerily pleasant to highly irritating; in the wild, parrots must call to each other over long distances to keep flocks together, and it is through such signals that most of their communication is made. It's best to spend frequent, short periods of time ..